The Lehigh Gap Wildlife Refuge consists of over 750 acres of varied habitat. The trail system threads through these habitats and provides visitors with approximately 13 miles of hiking trails at present. Loop hikes can easily be planned so that hikers need not retrace their steps. We hope you come out to the Refuge and enjoy the many hiking opportunities. Since 2002 we have been busy, along with our friends from the Allentown Hike Club, creating additional trails to connect to the existing Appalachian and Blue (North) Trails at the top of the mountain and other areas of the Refuge. Today you can come out to the refuge for a peaceful walk along level terrain, challenge yourself on some of the steeper trail sections, or do the Big Hike covering the entire trail system. Most people begin their visit to the Refuge at the Osprey House, headquarters of the Lehigh Gap Nature Center. Access to the Refuge is also available from Riverview Road at the western edge of the Refuge or from hiking in on the Appalachian Trail. Three trails meet at Osprey House parking area the Prairie Warbler Loop, D&L and LNE trails. The Osprey House and refuge can be accessed at the eastern end from Paint Mill Road off of Route 873, about 0.3 miles south of the bridge across the Lehigh River. (The refuge cannot be accessed directly from Route 873.) Paint Mill Road parallels Route 873, then goes under the bridge and parallels the Lehigh River for a short distance. It then accesses the eastern end of the refuge, where the Tannery Building and the Osprey House are located. There is a parking lot at the Osprey House and an upper lot a short distance beyond the Osprey House. The access road along the river parallels the Delaware & Lehigh National Heritage Corridor Trail. When completed, the D&L Trail will run continuously from Bristol, north of Philadelphia, to the Wilkes-Barre area, including running along the lower edge of the Lehigh Gap Nature Center for nearly 3 miles. From Route 248, take the Bowmanstown exit. Travel west on Route 895 a very short distance and cross the bridge over the Lehigh River. Just over the bridge make a left turn onto Riverview Road. Travel about one mile to where the road bends sharply to the right. You can park here, along the D&L Trail and enter the refuge. You can also continue on Riverview Road for a short distance to the stop sign at Sunset Road. Make a left on Sunset and a quick right and go up the hill to the LNE Trail (the upper railroad bed). You can park your car on the right and enter the refuge here. The Appalachian Trail is known as the “AT” to locals and to the hardy group of through hikers that have covered parts or all of the Appalachian Trail from Maine to Georgia. The AT traverses hardwood forests along the top of the Kittatinny Ridge and then descends to Route 873 at the Lehigh River bridge, and is well marked with white blazes. 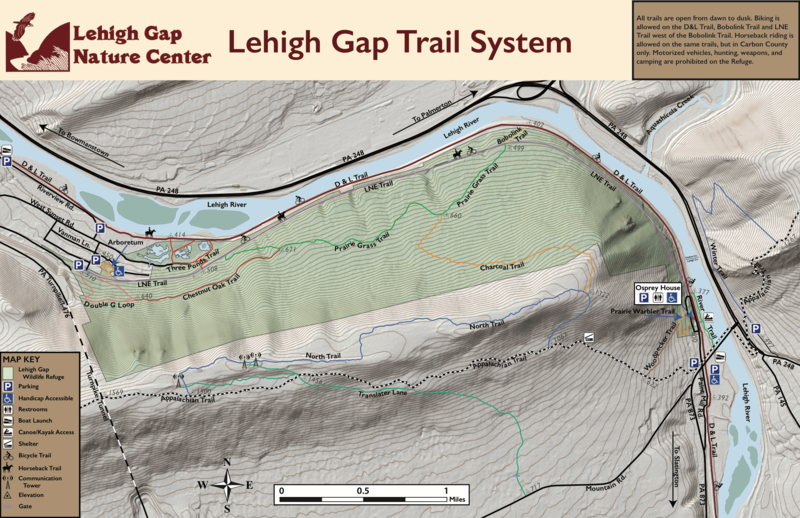 Vehicle access points to the AT near the LGNC include Lehigh Gap and Lehigh Furnace Gap. (1.5 miles from third tower (west) to Blue Trail, steady elevation change, steep at times). On the eastern end (Slatington side) of our property, parking is available near the Osprey House. Parking is available at the western end (Bowmanstown/East Penn side) of the refuge at the junction of Riverview Road and the D&L Trail. There is a sign posted in this area reading “Lehigh Gap Wildlife Refuge: A Community Resource.” Parking is also available at our arboretum and the western end of the LNE Trail. To reach this area, continue on Riverview Road to Sunset Road. At the stop sign make a left turn and then a quick right turn and make a left to enter the arboretum or drive up the hill to the LNE Trail. The parking area is to the right. There is a gate across the LNE Trail at this point, again to deter unauthorized vehicles on this trail. Near the Tannery Building an access pathway has been created down to the river, providing a river observation area and access for canoes, kayaks, and small boats. The trail system map and signs around the refuge will help orient you to the refuge’s trail system, although some of the smaller trails may be difficult to locate at this time. Enjoy exploring the refuge, and let us know what you find! !